Arlington, VA (April 9, 2015) – As the country marks the 150th anniversary of Abraham Lincoln’s assassination and the end of the Civil War, PBS announced today that THE CIVIL WAR, the award-winning film produced and directed by Ken Burns that first aired in September 1990, will be rebroadcast over five consecutive nights September 7-11, 2015 at 9:00 p.m. ET (check local listings). Lincoln – the first U.S. President to be assassinated – was shot by John Wilkes Booth on Good Friday, April 14, 1865, and died the following morning, just six days after the Confederacy surrendered to the Union Army. The broadcast, which coincides with the 25th anniversary of the original broadcast of THE CIVIL WAR, will present for the first time a newly restored high definition version. The restoration was done by Daniel J. White and supervised by Paul Barnes (lead editor of THE CIVIL WAR) of Ken Burns’s production company, Florentine Films, in association with the George Eastman House. Funding for the restoration was provided by Bank of America, PBS and The Corporation for Public Broadcasting. "Ken Burns is a longtime friend and supporter of George Eastman House, where his original negative is archived," said Paolo Cherchi Usai, Senior Curator of the Moving Image Department at George Eastman House. "Our new digital laboratory is enabling him to create high-quality digital elements for wider access to the public. Through this collaboration, Ken's creative work and our cultural mission have found a perfect match. It's the proof that film and digital can and should coexist. If used together in a responsible manner, both can make our cinematic heritage available for posterity." “The re-mastering and rebroadcast of THE CIVIL WAR is a testament to the timelessness of Ken’s films, which chronicle our nation’s history like no other,” said Bank of America Global Chief Marketing and Strategy Office Anne Finucane. Bank of America is underwriting the project, building on a longstanding partnership with Burns and PBS. While Burns had directed and produced other award-winning films on PBS prior to THE CIVIL WAR, including his first feature film, the Academy Award-nominated THE BROOKLYN BRIDGE (1981), THE CIVIL WAR quickly became the standard for historic documentaries. 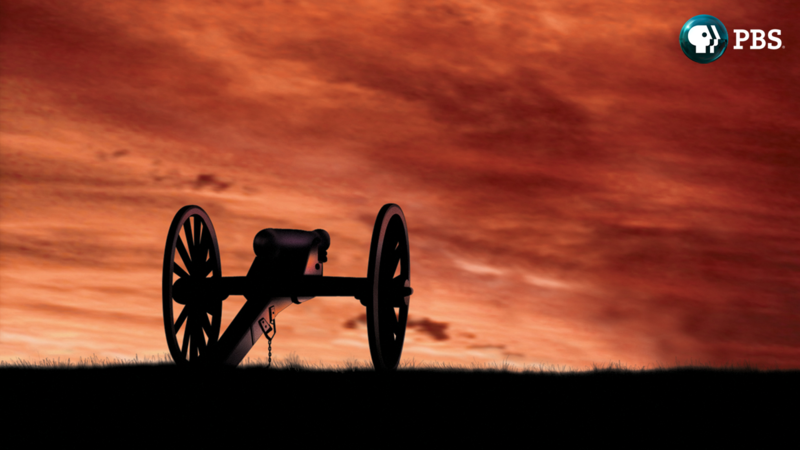 PBS Distribution will release the newly re-mastered version of THE CIVIL WAR on Blu-ray and DVD this fall. The six-disc set includes new bonus materials, including a short film on the re-mastering process and newly produced “making of” interviews. THE CIVIL WAR is narrated by David McCullough and includes the voices of Sam Waterston (Abraham Lincoln), Julie Harris (Mary Chesnut), Jason Robards (Ulysses S. Grant), Morgan Freeman (Frederick Douglass), Paul Roebling (Joshua L. Chamberlain, etc. ), Garrison Keillor (Walt Whitman, etc), George Black (Robert E. Lee), Arthur Miller (William T. Sherman), Chris Murney, (Pvt. Elisha Hunt Rhodes), Charley McDowell (Pvt. Sam Watkins), Horton Foote (Jefferson Davis), George Plimpton (George Templeton Strong), Philip Bosco (Horace Greeley, etc. ), Terry Courier (George McClellan), Jody Powell (Stonewall Jackson, etc.) and Studs Terkel (Benjamin F. Butler). For more information on the broadcast and the Civil War, visit www.pbs.org/civilwar. Images from the earlier broadcast and the 4K High Definition version are available at www.pbs.org/pressroom. PBS, with its over 350 member stations, offers all Americans the opportunity to explore new ideas and new worlds through television and online content. Each month, PBS reaches nearly 103 million people through television and over 33million people online, inviting them to experience the worlds of science, history, nature and public affairs; to hear diverse viewpoints; and to takefront row seats to world-class drama and performances. PBS’ broad array of programs has been consistently honored by the industry’s most coveted award competitions. Teachers of children from pre-K through 12th gradeturn to PBS for digital content and services that help bring classroom lessons to life. PBS’ premier children’s TV programming and its website, pbskids.org, areparents’ and teachers’ most trusted partners in inspiring and nurturing curiosity and love of learning in children. More information about PBS is available at www.pbs.org, one of the leading dot-org websites on the Internet, or by following PBS on Twitter, Facebook or through our apps for mobile devices. Specific program information and updates for press are available at pbs.org/pressroom or by following PBS PressRoom on Twitter.